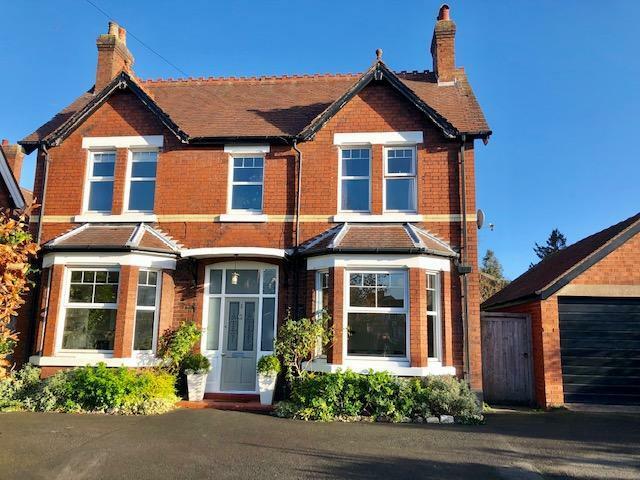 4 Bedroom Detached House For Sale in Stoke-on-Trent for Offers Over £600,000. A fantastic opportunity to acquire not only one of the areas most desirable properties, but also a plot of land with planning permission for a three bedroom detached property with access onto Crewe Road. (planning ref RE: 18/3777C 1) This stunning property has been beautifully modernised throughout and comprises entrance hall with real wooden floor, living room with feature polished cast iron fireplace, dining room with open grate real fire, W.C, "show room" standard dining kitchen with Corian worktops and centre island, utility room, dry cellar, four double bedrooms and an open plan en-suite bathroom which is fully tiled with travertine limestone tiles and a family bathroom with marble tiling and a contemporary suite. Externally the property offers further desirability with the long lawned garden to the rear backing onto the Mere. The property also has a double detached garage and ample off road parking on the drive for a number of vehicles. Truly a magnificent property!